This past Friday night, the hubbs and I took a step back in time to the music of our youth when we headed to the music center in downtown LA to see We Will Rock You at the Ahmanson Theatre. We Will Rock You captures the majestic grandeur and rock and roll spirit of the blockbuster hits of the legendary rock band QUEEN. 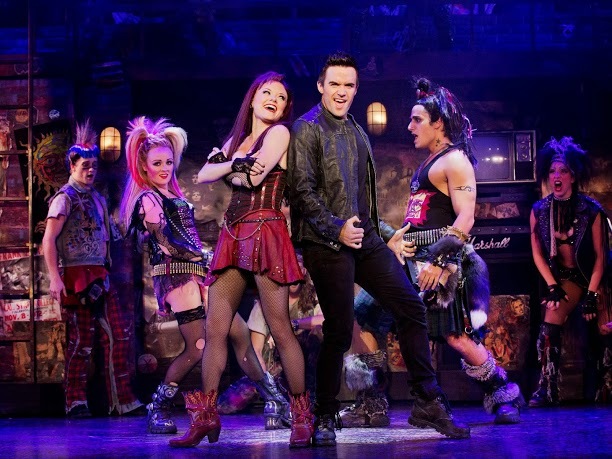 The plot of this fun, lively and entertaining musical centers around a future in which computer-generated music reigns, live rock is outlawed, and conformity is brutally enforced. But that all changes when a pair of young renegades, Galileo and Scaramouche, dare to break free and search for a long-buried electric guitar and along with it the much revered rock and roll music. This upbeat show makes you want to get up and rock out to iconic QUEEN songs like Another One Bites the Dust, We Are the Champions and We Will Rock You. The hubbs and I really had a fun time at this campy over-the-top musical meets rock concert and I couldn’t help clapping and rocking out in my seat. We truly enjoyed all the familiar music and the clever way the songs were weaved into the story. The male and female leads, Brian Justin Crum and Ruby Lewis were very talented and had strong, powerful, killer rock and roll pipes. I also loved the campy standout performance from Ryan Knowles as Buddy. *Save up to 40% on tickets for performances through Sunday, July 27. Mid-Orch rows R-W $49 (reg $65 – $75) and Preferred Mezz rows C-G only $59 (reg $85 – $99) when you use promo code RHAPSODY. Not valid on previously purchased tickets. Cannot be combined with other discount offers. All sales final. Subject to availability. Groups of 10 or more can save up to 25% off seats for performances through August 1! Student groups can purchase tickets starting at $22. Call 213.972.7231 to reserve now.